Nice story!! :) Well written. Note to self: do not ever eat at an Italian restaurant on Aldcliffe Road! I have seen a Hindi movie named Aggar on the same plot.. Although the movie has all additional masala.. but plot is same..
gtoospehere : Ha...passion and suspicion...there has to be trust and belief. Aditi : well...after all bollywood does make stories on real life...btw I have not seen that movie so cannot comment on it. nice..I like the style of writing!! Well done LP, very Othelloesque (if that's a word). Gosh!!! My heart skipped a beat when I read the last line!!! You are so good at writing this!!! Taut narrative!!! Your story made me sad. *Pout*. But in a nice way :) - got so damn involved with it, that I felt totally frustrated with Andre, at the end of the story. I mean, what an idiot. The story was very captivating and nicely described. The things that love can make you do is astounding. Kudos!!! Fantastic plot and captivating narration. Milana : I agree...obsessive love is dangerous. Thanks for your comment. Chatterbox: Welcome to my blog :) I am glad you liked it. You write wonderfully well.. Kp Up!! Well trod plot with interesting ending.Enjoyed thoroughly. 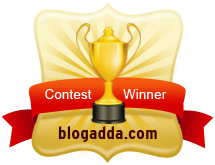 Arrived via Indiblogger primarily because I had written a story with the _same_ title a few years back.